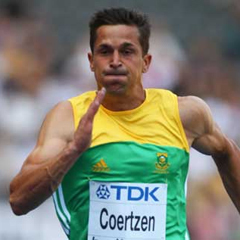 Cape Town - South Africa's Willem Coertzen has continued his impressive showing in the decathlon at the 2012 London Olympics when he won his 110m hurdles heat on Thursday. Coertzen posted a personal best time of 14.15, giving him 955 points for his effort under the decathlon scoring system. Coertzen, who entered the second day of competition in 11th place overall, moved up to ninth position with four events remaining.